An incomplete copper alloy Iron Age La Tene I brooch dating to the period c. 400 - 200 BC. 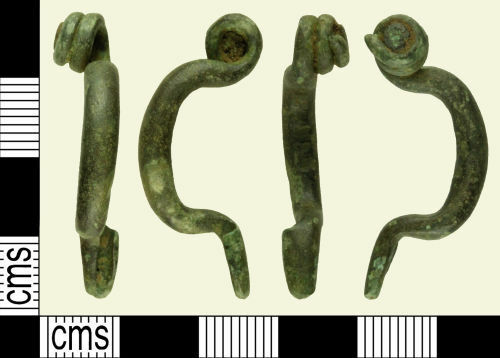 Only two loops of the pin remain wrapped around the remains of the copper alloy axis bar. It terminates in an old break. The pin is missing. The bow arches upwards from the head and is cylindrical in cross-section. The bow is undecorated. It then arches downwards into the foot which terminates in a curled catchplate. The brooch measures 31.48mm in length, 6.05mm maximum width, 2.87mm minimum width and is 6.46mm thick. It weighs 3.36g. Cf. Hattatt, R, 2007, p. 288, nos. 221 & 724.